“Thank you so much for your compassion and in going over and beyond in caring for your patients. I don’t know of any other dentist that would go to this extent to serve a patient. Your kindness does not go unnoticed. Thank you so much for all you do for Myron! Many thanks!" 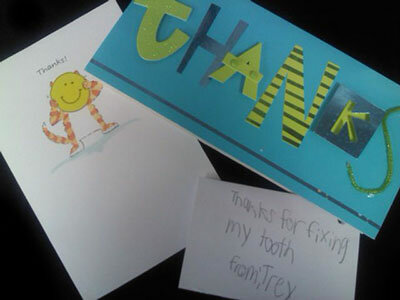 "Thank You for your generous donation of tooth brushes and toothpaste for our troops!" "Just wanted to Thank You so much for what you did for me financially. I am always amazed at how little I make yet how much I have." "Thank You for your generous contribution of 75 lbs of candy . Thank You for your generosity and support of men and women in uniform."